Diabetes is fast gaining the status of a potential epidemic in India with more than 62 million diabetic individuals currently diagnosed with the disease. India is second only to China which is home to 92.3 million diabetics. The International Diabetes Federation estimated a doubling of diabetic population between 1995 and 2005, and predicted 70 million diabetics by 2025. The current scenario of diabetes in India is likely to worsen in the coming decade. Indians have a greater tendency to develop diabetes and heart disease owing to the genetic factors. This increasing prevalence and risk of complications from diabetes necessitates active participation of patient’s to be active in diabetes management and self-maintenance. 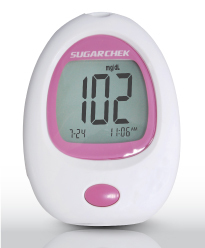 The Sugarchek meter is loaded with useful features for patient convenience. One touch operation: Easy to operate with an ergonomic design. Large LCD screen: with an ease to view test results even for elderly patient. 450 results storage : The patients can review the test results with date and time. Provides Glucose averages of 7,14,21,28,60 and 90 days. Proactive Ketone warning for readings > 240 mg/dl. Reliability: The Sugarchek strips are loaded with Glucose Oxidase technology (GOD), the trusted technology over years with high stability enzyme and least interference from other sugars. Accuracy: Sugarchek strips have the smallest reaction zone which significantly reduces the reading errors due to incomplete filling and ensures accurate results in first attempt. Stability : The Sugarchek strips are most stable packed in vials which protects the enzyme in the strips from extreme temperatures of 2 to 32°C and can be used upto 90 days once the vial is opened. Comfort : Sugarchek reads from even a speck of blood as it requires just 0.7 µl of blood. Sugarchek gives accurate and precise results in just 7 seconds. Alternate site testing: Sugarchek allows alternative site testing, with results equivalent to fingertip testing . Sugarchek has been graded with the highest accreditations from National Institute of Biologicals; ISO (International standard organization), EC (European commission) and USFDA.